“Do you want to go camping this weekend?” my friend Steffi asked me. The message came a few days before my return to Frankfurt after a week-long visit with family split between the two German cities, Bielefeld and Cologne. By chance, Steffi had found out the last of five Rhein in Flammen events of the year would be taking place the weekend I would be staying with them. Rhein in Flammen is an annual event every year in the summer involving fireworks and wine festivals at different locations along the banks of the Rhine. 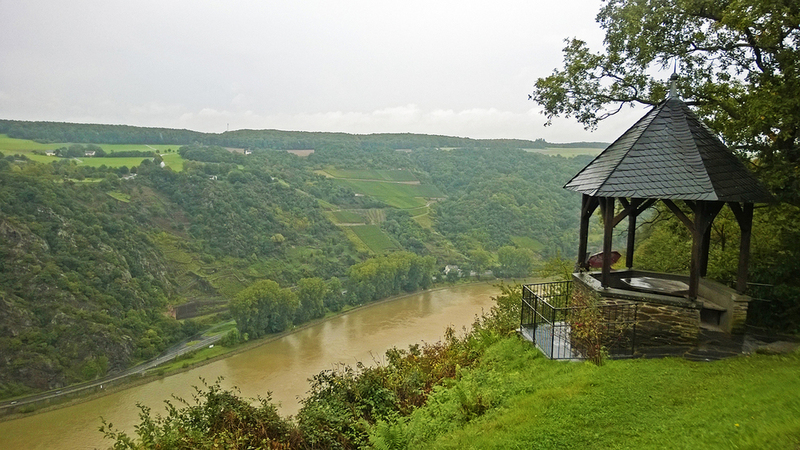 We drove the hour and a half to our camp site, Shönburg-Blick, down by the river in the town of Oberwesel. On the way, I got to practice my newly learned manual shift driving skills on the autobahn in Steffi and Flo’s Volkswagen. I went at most about 140km/hr which was plenty fast for me! After setting up camp, we admired the hills across from us with their rows of grape vines stretching up and away from the valley. Yachts and ferries were driving back and forth along th­­­­­e waterway, toting hundreds of people celebrating and waiting for the fireworks show later in the evening. The shuttle service took us to St. Goar, a small town where the festivities were being held just down the road from Oberwesel. Peering behind us in the shuttle, Oberwesel turned on its lights which cast golden on the side of every building against a blackening blue sky. A photo I snapped earlier of the castle, Shönburg, glowing down from above the town onto our campsite, is an example of how the whole town looked to us as we sped around the turn toward St. Goar. Rain started pouring down on our way over which was actually lucky. Instead of flooded with rain, the streets are normally flooded with people for the Rhein in Flammen. The rain kept the crowds down and the lines short. The air was warm making for a comfortable evening despite the wetness. The sun was hanging low in the sky highlighting the grey clouds behind the mountains lining the river. It competed with the colored lights of the town reflecting across the wet streets. We bought a bottle of Federweißer from vendors set up in front of shops facing the river. Federweißer is a sweet wine made with must, or pressed grape juice fresh from the fields on the surrounding hills. All of the wine sold here was in season and not even corked because it had so recently been squeezed and bottled. We were given ours with cups as the only lid covering the mouth of the bottle. Steffi and Flo insisted I try some onion cake to have with the wine. We found some in a shop and ate it on the street, huddled under our umbrellas. Federweißer was very sweet, like grape juice soda—a lovely balance to the thick, savory cake. Needing something more substantial to eat, we stopped at a stand selling flammkuchen. Flammkuchen is like a wafer-thin crust pizza with very light toppings, baked in the oven just until it’s lightly crispy. This was a family run business that operates only once per year at this event. They had a wonderfully organized assembly line going—the older man in the family flattened the dough, the young woman spread the ingredients on, the young man worked it into and out of the oven, and the older woman cut it and served. I shared the photos I took of them and they offered to take one of us. The fireworks show was about to start, so we made our way to the edge of the water. Soon, all of the boats on the river parted to allow a single boat carrying the fireworks to make its way to the center of the river. We were perfectly positioned to see the fireworks shoot off right in front of us. They also shot off from the two castles, Burg Maus and Burg Rheinfels, on each side of the river—in a display that made the castles look like they were on fire from the plumes of smoke billowing up from their walls. The whole river looked like a war zone especially when the fireworks reflected red against ribbons of smoke in the pitch night sky. I don’t know if it was the fact that we were so close to the fireworks, right there in front of us on the river, but this was the best fireworks show I have seen in my life. One of my favorite fireworks was one I had never seen before—they shot it off directly into the water and it dispersed and bounced off the water in random directions. Different colors—red, green, yellow—jumped on the surface of the water like water strider bugs. After the firework show, we retired to our campsite. We slept well in our large tent through the night, and rose early to catch a train back to St. Goar to go on a hike. As we headed to the top of the hill stretching along the Rhine, we were advancing on Burg Rheinfels. We decided to take a self-guided tour through its rooms and halls before hitting the trail. Considered a landmark of the city, Rheinfels was originally built as security for a nearby toll station in 1245, and became known as an “unconquerable fortress” through the middle ages. Burg Rheinfels easily became my favorite castle visit to date because of the ability to see so much of the place completely on your own. What made the experience extra special for me was the chance to explore its mine tunnels. We got to navigate through the darkest parts of the castle underbelly as if we were Arya wandering the depths of the Red Keep. 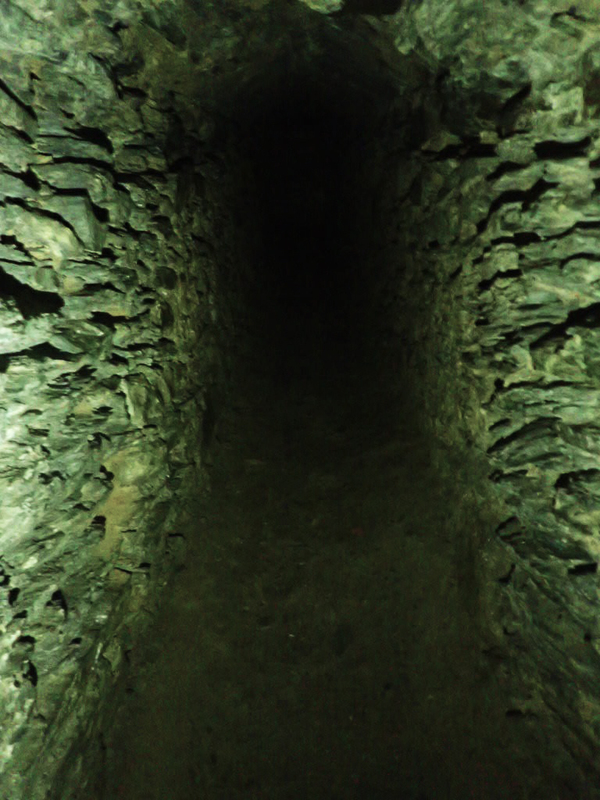 The criss-crossing, staircase-spiraling, original tunnels beneath the fortress would have gotten us lost if it weren’t for the flashlights on our phones to help guide the way. Like watching the sword fighters at the Sparrenberg in Bielefeld, the nerd in me was feeling utterly fulfilled by this experience. After almost two hours spent, we left the castle and headed for the trails. The weather had turned very rainy but we all voted to stick to the plan and do the 3-hour hike. 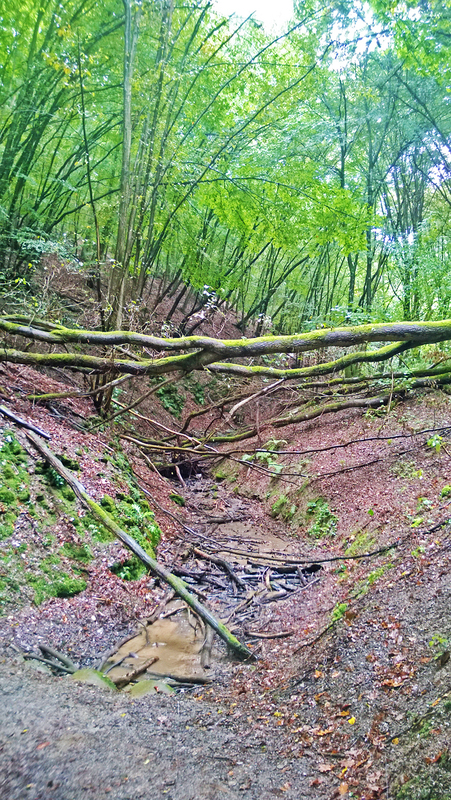 The trail took us along the wooded edge of the hills behind the towns and roadway bordering the Rhine back to Oberwesel. Flo was a trooper carrying a large bag of food and other necessities as we trekked. The trail markers took us through forest, around small residential areas, over a waterfall, across farm land, along muddy roads, and back down into the valley. Up hills and down again, we pushed through the bad weather. Along the way, we encouraged each other to keep going and had a great laugh at pretending we were a party of travelers in a medieval era: a princess (Steffi), a mage knight (me), and a pack mule (Flo). At one point on our journey we came across various funny artistic figures made of scrap metal. Trolls, they were called. Along the way, we ate walnuts off the trail path and blackberries from bushes, and when we finally made it down into the valley we pulled directly off the vines the juiciest, sweetest grapes I’ve ever tasted. 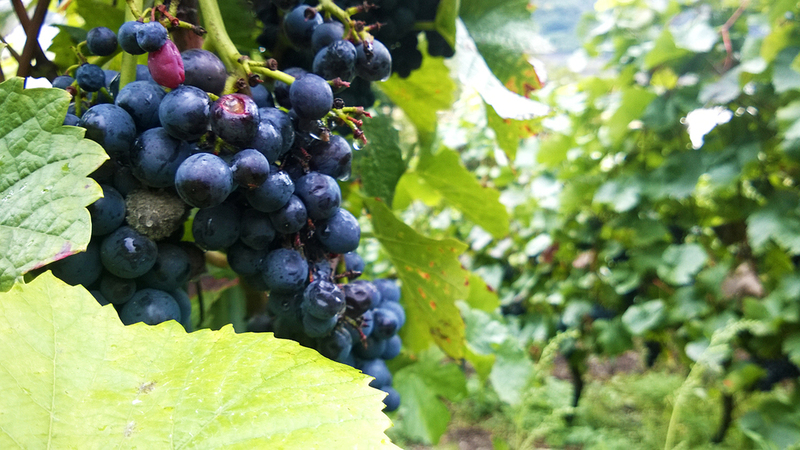 Walking back through the town of Oberwesel, I noticed grapes growing on vines hanging all around the town. The entire town was devoted to the area's wine industry. They were obviously proud of it and they should be. 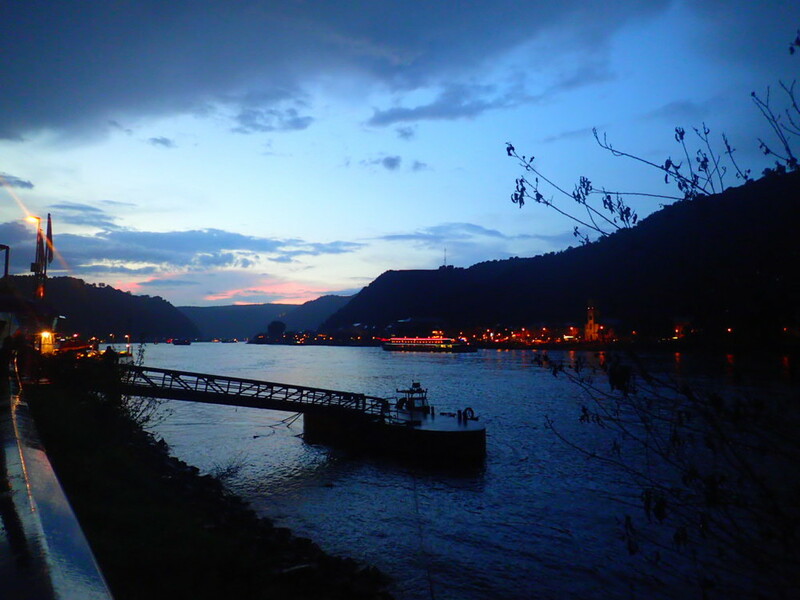 I highly recommend visiting both Oberwesel and St. Goar even if the Rhein in Flammen does not coincide with your visit. Lots of cute shops line the streets and cafes offer outdoor seating to sip wine on days when the sun is shining. We would have stayed longer if not for being worn out and soaking wet by the time we made it back to the car!